Masses of tiny white flowers in Summer/ Autumn, oval red fruit ripening in the Winter. The fruit can be eaten by cutting them in half and scooping out the pulp and seeds or by biting off a piece of the rind and sucking out the insides. 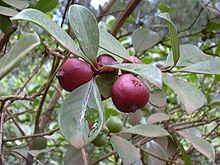 Strawberry guavas taste like a passion fruit mixed with strawberry. Evergreen large shrub, small tree. As a mature plant, the trunk has a wonderful shiny brown bark. Frost hardy. Drought resistant. Full sun/ part shade.